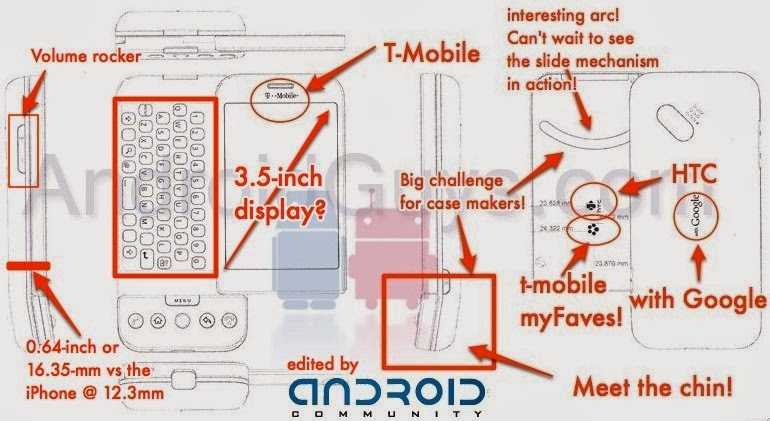 Over at Android Community, they took the previous engineering renderings of the HTC Dream and highlighted every key feature that could be determined. Some new nuggets of information is that the HTC Dream is assumed to be 16.35mm, which is decent considering the iPhone is around 12.3 mm thick and the HTC Dream includes a slide out keyboard. Obviously, with all these moving parts: a slide out keyboard, a strong chin, touchscreen, etc, it looks like it will certainly take time before case makers make a stylish and functional case. Unlike other phones which are typically one slab and that's it, it looks like the HTC Dream is going to be a wee bit more complicated than just that. We'll soon see! This is an informative post review. I am so pleased to get this post article and nice information. I was looking forward to get such a post which is very helpful to us. A big thank for posting this article in this website. Pre-Order the T-Mobile G1: Oct 22nd, $179. Google Chrome Coming to Android? HTC Dream to Launch September 23rd ? HTC Dream Rendered By Artist, Looks Sweet! HTC Dream Starts Pre-Sales September 17th?